Here at The Potter Man Studio, we run pottery classes and workshops for adults, children and families as well as Birthday parties, Hen parties and events for a variety of local and national clubs and societies. I also visit schools, community groups & specialist care settings to run workshops for people of all ages and abilities. I currently have some availability in most classes - Please contact me to check day and time. You can enrol on a class at any time. 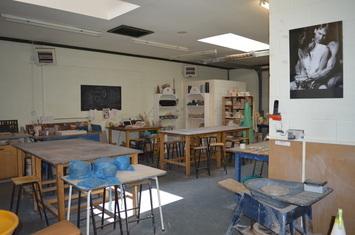 Each 3 hour pottery class costs £30/person and includes tuition, clay, glaze, firing, use of studio facilities & equipment, tea & coffee and library. Working in a creative and supportive environment, you will gain experience and confidence working in small classes. Each class will begin with an introduction to a particular technique or process, including a demonstration and project ideas. You will then be able to try out the technique and produce your own piece of work or continue working on pieces already started. You will have the opportunity to explore many different pottery techniques and styles including coil building, slab building and wheel throwing. To aid planning of classes and studio time I will need you to confirm your planned attendance a month in advance (4 weeks). If you are unable to attend a pre-booked session, please let me know as soon as possible. Your session will then be carried forward so you will not loose out, but it will allow me to plan the studio time more effectively.